I have recently been faced with a problem that I often see with my clients - the inability to get rid of the tiny, niggly little stuff that has no immediate use. The above shot is a photo of the inside of the medicine cabinet in my bathroom. I don't own much make-up, so the three shelves are filled with essential oils, dental floss, toothpaste, bath salts and the massage oil that I add to my daily baths. 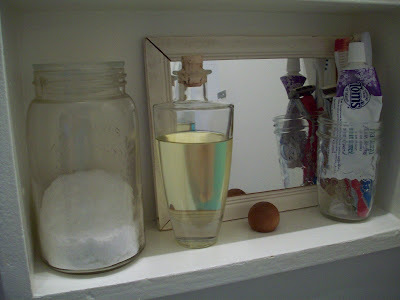 I keep the oil in a beautiful glass bottle, and until recently the bottle cork was topped by a lovely wooden ball. The wooden ball has come off. Now, I love wood. You'll find wooden objects throughout my apartment. It pleased me to no end that my oil bottle had a wood-topped cork. But that wooden ball is now non-functional. It's so impregnated with oil that I could never glue it back onto the cork again. (Which is probably how it came unglued in the first place.) I have no other use for it. But could I get rid of it? Not for several weeks. First I tried shoving it back onto the cork, hoping they would stay stuck together. 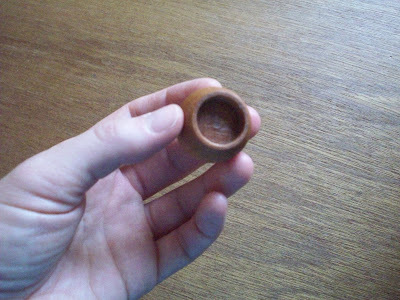 Then I got irritated every time I tried to uncork the bottle and the wooden ball came off in my hand. It's just so beautiful. How could I throw it out? Indecisive, I kept it on my medicine cabinet shelf. I see this with organizing clients all the time. They can't make a decision, so they don't make a decision - not realizing that they have just, by default, made a decision. To keep it. My advice? Just get rid of it. Find a good home for it if you can (reduce, reuse, recycle), but if after several days (or weeks) you find yourself paralysed by not knowing what to do with it, just get rid of it. My wooden ball went into the garbage this morning. I canNOT tell you how many of these postponed decisions I have laying around, taking up physical and mental space everywhere.